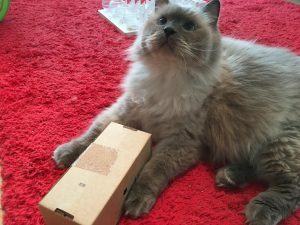 Once again, there’s no need to dig deep into your wallet to provide your cat with mental stimulation and food-puzzle-fun! 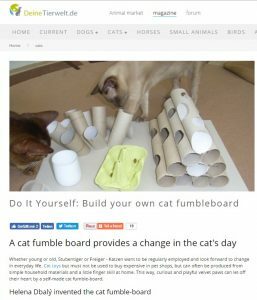 Here’s a great video showing a simple but versatile fun board – plus cute footage of two cats using it!!! 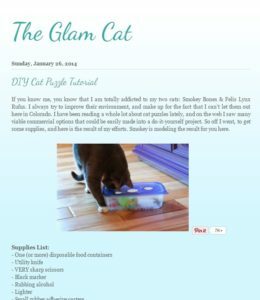 Pretty, functional, and DIY BABY! This beautiful blue food puzzle is a rolling tube made with a 3-D printer. 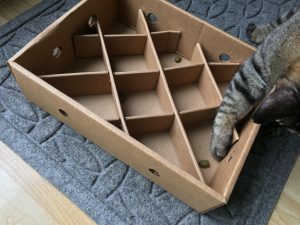 The dimensions of the puzzle and holes can be changed to suit your cat’s needs, diet, and challenge level! (Right now it’s set to “Science Diet size”). You can download the files HERE. A Harry & David pear box! 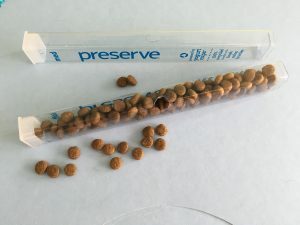 What an easy and cheap (let’s be honest these are generally free as they are often given as gifts) food puzzle! 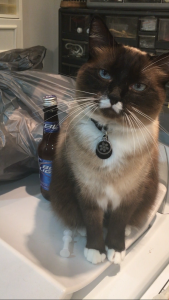 Simply take the lid off and sprinkle kibble inside. 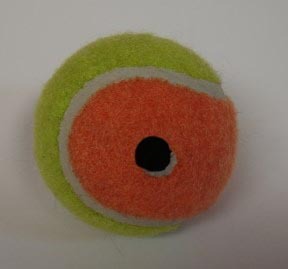 To increase difficulty place other objects inside the compartments to serve as an obstacle. It really cannot get much easier than this folks! 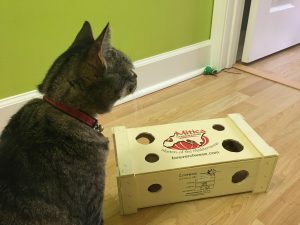 Looking for three simple food puzzles you can make for your cat? 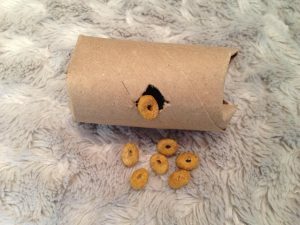 Here are complete instructions on three different types of puzzles: a stationary board, a rolling feeder, and a peekaboo box style feeder! 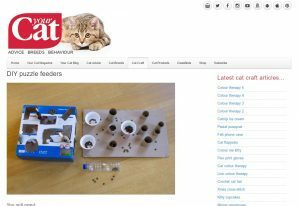 Thanks to Your Cat Magazine for the great ideas! 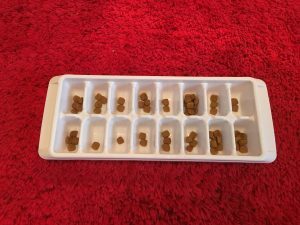 More DIY – an egg carton can be a food puzzle! 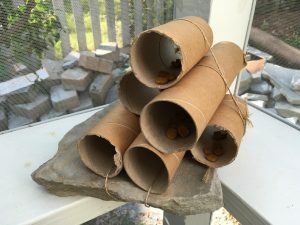 This is a nice homemade take on the Stimulo – by suspending cups from the lid of a cardboard box, this puzzle can be used for either fishing food out, or directly noshing from the cups! With some great videos too! Instructions available from the always handy-dandy Instructables website! 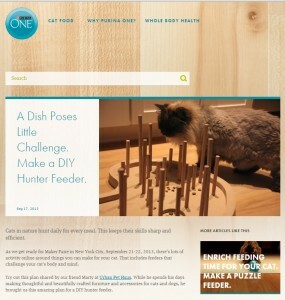 We love seeing how people get creative with homemade puzzles, and sometimes people get fancy. 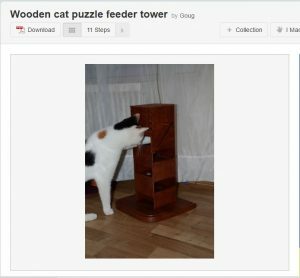 Making this puzzle requires some wood-working skills, but can easily be customized to your own preferences and your cat’s needs! 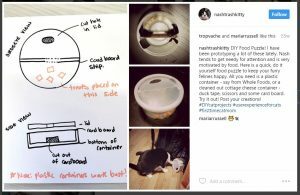 Brought to us thanks to Goug via Instructables – all the details you need are HERE! When is a chair not a chair? When it’s a food puzzle! 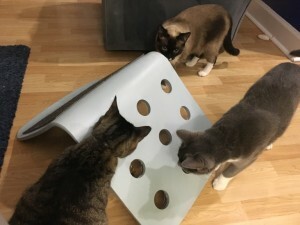 Check out this blog post where Ingrid shares how she turned an Ikea chair into a food post and scratching pad! Complete instructions are included. 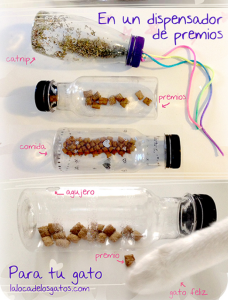 For the crafty cat parent! 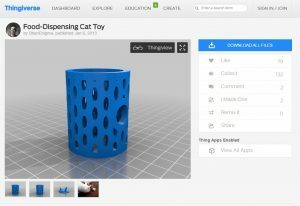 Have a 3-D printer? Then you can turn a regular food bowl into a foraging challenge!! 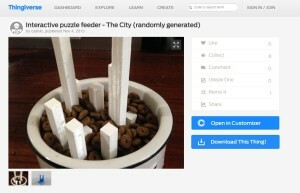 Thingiverse, a website dedicated to sharing resources related to 3D printing, has a template for creating your own city landscape that you can place in a food dish for your kitty to eat around.